Welcome To Official WebSite Of Odisha Legislative Assembly. Odisha became a separate province on the 1st day of April, 1936 by Government of India (Constitution of Odisha) Order, 1936. It comprised portions of the then Bihar and Odisha Province, Madras Presidency and the Central Provinces. The province of Odisha was placed under the personal Rule of the Governor till the end of March, 1937. An Advisory Council consisting of 20 persons was formed to advise the Governor on the administration of the provinces. Shri Biswanath Das was elected as the leader of the Congress Party. Under the directive of the Congress High Command, Shri Das expressed his inability to accept the invitation to form the Ministry, unless the Governor assures that "he would not use his special powers of interference or set aside the advice of Ministers in regard to constitutional activities". The Governor was not prepared to give such assurance in view of the constitutional provisions. As the leader of the majority party refused to form Ministry and the Government was bent upon inaugurating the new constitutional scheme for provinces on scheduled time, the Governor appointed Shri Krushna Chandra Gajapati Narayan Deo, the Maharaja of Paralakhemundi, the Prime Minister of Odisha on the 1st April, 1937. Besides the Prime Minister, Mandhata Gorachand Patnaik and Maulavi Latifur Rahman were two other Ministers in the Council of Ministers. Normal political situation came to prevail when the Congress High Command permitted the Congress Party in the province to form Ministry on the basis of formal assurance from the Governor General in regard to exercise of Governor’s special powers. The interim Government resigned on the 13th July, 1937 which was accepted on the 19th July, 1937 and Shri Biswanath Das was appointed as the Prime Minister on the 19th July, 1937. The first Congress Ministry consisted of three Members; two other Ministers were Shri Nityananda Kanungo and Shri Bodharam Dube. The Members of the First Assembly were administered oath on the 26th and the 27th July, 1937. The first historic Session of this Assembly was held in the Ravenshaw College Hall, Cuttack on the 28th July, 1937. On the same day, Shri Mukunda Prasad Das and Shri Nanda Kishore Das were elected Speaker and Deputy Speaker, respectively. Babu Bichitrananda Das, a Member of the Assembly, conducted the election of Speaker. The Congress Ministry resigned on the 4th November, 1939 in protest against involvement of India in the Second World War by the British Government without consultation with its popular representatives. The Governor accepted the resignation of the Ministry on the 6th November, 1939 and assumed direct responsibility for the administration of the province from the same day (i.e. the 6th November, 1939), but the Assembly was kept under suspended animation. The Proclamation was revoked on the 23rd November, 1941. A coalition Ministry was sworn in on the 24th November, 1941 with Maharaja of Paralakhemundi as the Prime Minister and Pandit Godavarish Mishra and Maulavi Abdus Sobhan Khan as two other Members of the Council of Ministers. Due to difference among the partners in the coalition Government the Prime Minister resigned on the 20th June, 1944. However, the resignation of the Prime Minister and other Ministers were accepted on the 29th June, 1944 and from the 30th June, 1944, Odisha was placed under Governor’s Rule. Proclamation was revoked on the 23rd April 1946. The Assembly had altogether 10 sessions with 188 sitting days in all till it was dissolved on the 14th September, 1945. There was no separate Assembly Secretariat and its administration was put in charge of Law Department of the State Government. Nominated Members were appointed on the advice of the Prime Minister. Dr. Harekrushna Mahtab was elected leader of the Congress Party and formed the Ministry on the 23rd April, 1946. Shri Nabakrishna Choudhury, Pandit Lingaraj Mishra, Shri Nityananda Kanungo and Shri Radhakrushna Biswasray were the other members of the Council of Ministers. Dr. Harekrushna Mahtab resigned on the 12th May, 1950 as he was to join the Cabinet at the Centre and Shri Nabakrushna Choudhury took over as the Chief Minister on the same day. Mr. Lal Mohan Patnaik and Smt. A Laxmibai were elected as Speaker and Deputy Speaker respectively on the 29th May, 1946. Shri Lakshminarayan Sahu a Member of the Assembly conducted the election of the Speaker. It is relevant to note that on 1st January, 1948, 25 princely States merged in the province of Odisha. In pursuance of the provisions of the Administration of Odisha Order, an Assembly for Odisha States called "Odisha State Assembly" was constituted with 36 members. These included 31 Members appointed by the Provincial Government from the merged States and five ex-officio Members namely, the Prime Minister of Odisha, three Members of the Executive Council constituted under the said order to aid and advise the Governor in the administration of the princely States and the Chief Administrator and Special Commissioner. After final merger of princely States with Odisha the seats in the Legislative Assembly was increased from 60 to 91 w.e.f. the first day of August, 1949 under the States Merger (Governor's Provinces) Order, 1949. On the 9th September 1949 the Governor-General of India nominated 31 persons to fill the additional seats in the Odisha Provincial Legislative Assembly to represent the people of the states or group of states. Thus during the period two Assemblies were functioning, viz., the Odisha Provincial Assembly and the Odisha States Assembly. On the 30th September, 1946, a motion was adopted in the Assembly to shift the Capital of Odisha from Cuttack to Bhubaneswar. In the year 1948, a separate department was formed for the administration of Assembly affairs under the Administrative control of the Home Department of Government of Odisha. After merger of princely States and inclusion of 31 representatives from the States, the historic session was held in the New Capital at Bhubaneswar for the three days on 10th, 11th and 12th October, 1949 after which it shifted back to Cuttack. The Assembly had altogether 14 sessions with 224 sitting days and it was dissolved on the 20th February, 1952. The General Election for the Second Assembly was held from the 24th February, 1957 to the 12th March, 1957. The elected members took oath on the 10th and 11th April, 1957. Shri Nanda Kishore Das, Speaker of the Assembly, administered oath to the Members. The First Session was summoned to meet on the 27th May, 1957. There was a demand to separate the administrative control of Assembly from Home Department. On the 11th December, 1957 as a result of a point of privilege raised in the Assembly, a committee was formed by the House to give a final report. In 1958, Assembly Department was declared a separate Secretariat (Vide Home Department Order No.20359—A, dated the 26th September, 1958). Dr. Harekrushna Mahtab as the Leader of the largest single party in the legislature was appointed Chief Minister on 6th April, 1957. Shri Rajendra Narayana Singh Deo was declared as the Leader of the Opposition. However, the Minority Government proved shaky and the Congress-Gantantra Parishad formed coalition Ministry on the 22nd May, 1959. The coalition Ministry resigned on the 21st February, 1961 due to differences in the Congress Party. President’s Rule was imposed for the first time in the State on 25th February, 1961. The Second Assembly had 7 sessions with 254 sitting days and it was dissolved on 25th February, 1961. Pandit Nilakantha Das was elected Speaker of the Assembly on 27th May, 1957 and Shri Jadumani Mangaraj was elected Deputy Speaker of the Assembly on 29th May, 1957. The tenure of Pandit Nilakantha Das as the Speaker is memorable because of the fact that it was he who drew the attention of the Government of India to the provision of the constitution "whenever the Assembly is dissolved, the Speaker shall not vacate his office until immediately before the first meeting of the Assembly after the dissolution". The Government of India agreed with his interpretation and allowed him to continue in office even after the dissolution of the Assembly. It has now been accepted by the Government of India in all cases of dissolution of the Assemblies in different States. Construction of a separate building for the Assembly at an estimate cost of Rs.25,00,000 with the plinth area of 47,000 Sq.ft. was completed in early part of 1961. The building was inaugurated by the then Vice-President of India Dr. S. Radhakrishnan on the 12th February, 1961. The Mid-term Election to the Third Assembly was held from the 2nd June to the 8th June, 1961. The elected Members took oath on the 26th and 28th June, 1961. The Third Assembly held its First Session in the new building on the 21st August, 1961. As the Leader of the majority party, Shri Biju Patnaik became the Chief Minister and formed the Ministry on the 23rd June, 1961. Subsequently Shri Biren Mitra and Shri Sadasiva Tripathy became the Chief Minister on the 2nd October, 1963 and 21st February, 1965 respectively. Shri Rajendra Narayan Singh Deo was the Leader of the Opposition during this period. The Assembly had total 10 sessions with 335 sitting days and it was dissolved on the 1st March, 1967. Shri Lingaraj Panigrahi, the former Chief Justice of Odisha High Court was the Speaker and Shri Loknath Mishra was the Deputy Speaker. The election to the Fourth Assembly was held on the 21st February, 1967. The newly elected Members took oath on the 17th March, 1967. The First Session of the Assembly met on the 23rd March, 1967. Meanwhile Ganatantra Parishad had merged itself in the Swatantra Party of India. A new regional party, Jana Congress had come into being under the leadership of Dr. Harekrushna Mahtab. Both Swatantra and Jana Congress Party formed the Coalition Government with Shri R.N. Singh Deo, the Leader of the Swatantra Party, as the Chief Minister. Shri Sadasiva Tripathy, the Leader of Congress Party, was declared Leader of Opposition in the Fourth Assembly. Due to difference between the parties the Coalition Government collapsed on 9th January, 1971. An anomalous situation of constitutional interest arose with the resignation of the Chief Minister. The Governor accepted the resignation of the Chief Minister with effect from 8-30 p.m. on 9th January, 1971. But the President’s Rule was imposed on 11th January, 1971. For a little more than one day the State was under the direct rule of the Governor, which caused a lot of controversy in those days. The Assembly was kept under suspended animation till dissolution on 23rd January, 1971. The Fourth Assembly had all total 10 sessions with 197 sitting days and it was dissolved on the 23rd January, 1971. Shri Nanda Kishore Mishra and Shri Harihara Bahinipati were the Speaker and Deputy Speaker respectively. In 1969 there was split in the Congress Party into Congress (R) and Congress (O). A new regional party called "Utkal Congress" under the leadership of Shri Biju Patnaik was formed towards the end of this period. The elected members took oath on the 9th and 10th April 1971. The first session of the Fifth Assembly was summoned to meet on the 3rd May, 1971. Swatantra Party along with the new regional Party Utkal Congress formed the Coalition Ministry with Shri Biswanath Das as the Chief Minister. Shri Das was appointed Chief Minister on the 3rd April, 1971. As at the time of appointment Shri Das was not the member of the Assembly, he was elected subsequently from Rourkela Constituency in the bye-election as Independent candidate. Due to defection of large number of members from the ruling party the Government fell and Shri Biswanath Das resigned on the 14th June, 1972. Smt. Nandini Satpathy, the Leader of the Congress Party, formed the Government on the 14th June, 1972 and continued till 3rd March, 1973. At the time of her assumption of Office, Smt. Satpathy was not the member of the House. Subsequently she was elected from Cuttack City Constituency in a bye-election. From the 4th May, 1971 to the 14th June, 1972 Shri Binayak Acharya then the Leader of Congress (R) Party was the Leader of Opposition. Shri R. N. Singh Deo (Swatantra) became the Leader of Opposition on the 14th June, 1972 and continued till the 9th February, 1973. Again a new party named Pragati Legislature Party was formed with the Utkal Congress, Swatantra Party and others as its constituents and Shri Biju Patnaik, Leader of the Pragati Legislature Party became the Leader of the Opposition on the 9th February, 1973 and continued till the 3rd March, 1973. Defection from the Congress (R) Party led to fall of the Government leading to imposition of President’s Rule on the 3rd March, 1973. The party position fluctuate with merger and counter merger, defection and counter defection during this period. Only five sessions with 97 sitting days were convened during the span of the Fifth Assembly and it was dissolved on the 3rd March, 1973. Shri Nanda Kishore Mishra and Shri Narayan Birabar Samanta were the Speaker and the Deputy Speaker respectively of the Fifth Assembly. The strength of the Sixth Assembly was increased from 140 to 147 after delimitation of constituencies. Election to the Sixth Assembly was held on the 24th February, 1974 and the Members of the Sixth Assembly took oath on the 11th March, 1974. General Election to Chilka Assembly Constituency was not held as no nomination was filed. Smt. Nandini Satpathy, Leader of the Congress Party, formed the Ministry on the 6th March, 1974. Shri Biju Patnaik, Leader of Pragati Legislature Party was declared Leader of the Opposition on 19th March, 1974 and continued as such till the 10th December 1974. In the bye-election held on the 7th July, 1974, Shri Raghunath Ray, I.N.C. candidate was elected from the Chilka Assembly Constituency. Towards the end of 1974, Bharatiya Lok Dal, a new All-India Party came into being with the merger of seven parties including Utkal Congress, Swatantra and S.S.P. On the 10th December, 1974, Pragati Legislature Party was renamed as Bharatiya Lok Dal Legislature Party and Shri Biju Patnaik as the Leader of the Bharatiya Lok Dal was declared Leader of Opposition. Shri Patnaik continued as such till 24th March, 1977. The Janata Party was formed with the amalgamation of Bharatiya Lok Dal, Congress (O) and the Socialist Party in early 1977. On the 31st March, 1977 formation of the Janata Legislature Party was announced in the House and Shri Ram Prasad Mishra, Leader of Janata Legislature Party, was declared the Leader of Opposition and he continued to function as such till 30th April, 1977. Smt. Satpathy resigned on 16th December, 1976 and Odisha was placed under President’s Rule till 29th December, 1976, but the Assembly was kept under suspended animation. Shri Binayak Acharya was elected as the Leader of the Congress Party in place of Smt. Satpathy and became the Chief Minister of Odisha on 29th December, 1976 and continued as such till 30th April, 1977. The State was placed again under President’s Rule from 30th April, 1977 to 26th June, 1977. Shri Braja Mohan Mohanty was the Speaker and Shri Chintamani Jena was the Deputy Speaker of the Sixth Assembly. The Sixth Assembly had all total 9 sessions with 150 sitting days and it was dissolved on 30th April, 1977. There was split in the Janata party on the 13th September, 1979. Janata (O) Legislature Party with 28 members was given recognition and its leader Shri Prahallad Mallick was declared Leader of the Oposition on the 3rd September, 1979 and he continued as such till the 13th February, 1980. Janata (O) Legislature Party was renamed Janata Legislature Party and the Janata Party in power was renamed Lok Dal Legislature Party on the 13th February, 1980. Shri Ananta Narayan Singh Deo of Janata Legislature Party was declared on the same day, the Leader of Opposition in place of Shri Prahallad Mallick. Shri Satyapriya Mohanty was the Speaker and Shri Surendra Nath Nayak was the Deputy Speaker of the Seventh Assembly. The State was put under President’s Rule on the 17th February, 1980 and the House was dissolved. The Seventh Assembly had all total 7 sessions with 121 sitting days and it was dissolved on 17th February, 1980. Shri Janaki Ballav Patanik, the Leader of the Congress (I) became the Chief Minister on the 9th June, 1980. At that time he was not the Member of the House. In the bye-election Shri Patnaik was elected from Athagarh Constituency. Shri Biju Patnaik, Janata (CS) elected both from Patkura Assembly Constituency and Kendrapara Parliamentary Constituency, resigned on the 11th June, 1980 as a member of the Assembly. Shri Rasananda Sahoo, Congress (I) Member form Athagarh Constituency resigned on the 7th October, 1980 to make way for election of Shri J.B Patnaik. In the Bye-election for three seats held on the 23rd November, 1980, two seats (Athagarh and Nimapara ) went to the Congress (I) and one seat (Patkura)to Janata (CS). Shri Somnath Rath was unanimously elected as Speaker on the 12th June, 1980 and Shri Himansu Sekhar Padhi was elected Deputy Speaker on the 2nd July, 1980. Shri Rath resigned on the 11th February, 1984 and joined the Council of Ministers. Shri Prasanna Kumar Dash was elected as Speaker on the 22nd February, 1984. None of the Opposition Parties secured the requisite number of seats to form a recognised Opposition Party. With resignation of 2 members from the Lok Dal, the party had 11 members in the Legislature. Consequent upon the merger of Janata (CS) or Lok Dal and Janata (J.P.) the new party came to be known as the Janata Legislature party with 14 members on the 23rd February, 1983. Shri Sarat Deb was the leader of the Janata Legislature Party. However, on the 2nd April, 1984 an United Front Legislature Party with the Members of the Janata party and some members of C.P.I. was formed with Shri Sarat Deb (Janata) as its Leader. As the Front had the requisite number to from the Parliamentary Party, Shri Deb was declared the Leader of opposition. Subsequently the members of C.P.I. withdrew from the Front, but as some members of the Democratic Socialist Party joined the Front, the status of the Leader of the opposition was not affected. On the 5th September, 1984 Democratic Socialist Party came into being in the legislature with two members who had resigned from Congress (I). The Eighth Assembly had total 10 sessions with 176 sitting days and it was dissolved on the 9th March, 1985. The Chief Minister and the Council of Ministers resigned on the same day. The General Election for the Ninth Assembly was held on the 5th March, 1985 for 145 seats (out of 147 seats, since elections for Kakatpur and Keonjhar seats were countermanded due to death of the contesting candidates. Shri Janaki Ballav Patnaik, who was elected from both Athagarh and Khurda Constituencies, resigned his membership from Khurda Constituency on the 15th March, 1985. The new Assembly was constituted on the 9th March, 1985. Shri Janaki Ballav Patnaik, the Leader of the Congress Legislature Party was sworn in as the Chief Minister on the 10th March, 1985 and five Cabinet Ministers and ten Ministers of State were sworn in on the 12th March, 1985. Shri Shradhakar Supakar was the Protem Speaker. The newly elected members took oath on the 13th March, 1985. The first Session of the Ninth Assembly commenced on the 14th March, 1985. Shri Prasanna Kumar Dash, the Speaker of the dissolved Assembly was unanimously elected as the Speaker on the 14th March, 1985 and Shri Chintamani Dyan Samantra was unanimously elected as Deputy Speaker on the 18th March, 1985. Shri Biju Patnaik, the Leader of the Janata Party, was declared the Leader of the Opposition on the 22nd March, 1985. In the bye-election held on the 24th April, 1985, two seats (Kakatpur and Keonjhar Constituencies) went to Janata Party candidates and one seat (Khurda Constituency) went to an Independent candidate. Shri Bhabendra Nath Majhi, a sitting Congress (I) Member from Rairangpur Constituency, expired on the 3rd March, 1986 and Shri Chaitanya Prasad Majhi, Janata Party candidate, was elected in the bye-election held on the 23rd November, 1986. Shri Purna Chandra Mahananda another sitting Congress (I) Member from Titilagarh Constituency expired on the 18th May, 1989. Shri Bhajaman Behera, Congress (I) Member (Talcher) ceased to be a Member of the House under Anti-Defection Act, with effect from the 15th September, 1989. Shri Trilochan Kanungo, Independent Member (Govindpur) resigned on the 15th September, 1989 from his Membership. Four sitting Members (Three from Janata Dal and one Independent) also resigned from their membership on the 6th and 7th December, 1989, as they were elected to Lok Sabha in the General Election held on the 24th November, 1989. Shri Raj Kishore Pradhan, Congress (I) (Deogarh) and Shri Bibhudhendra Pratap Das, Congress (I) (Pallahara) resigned on the 30th December, 1989 from their membership. Shri Janaki Ballav Patnaik, Chief Minister resigned on the 7th December, 1989 and Shri Hemananda Biswal became the Chief Minister on the same day. The Assembly had all total 11 sessions with 188 sitting days and the Ninth Assembly was dissolved on the 3rd March, 1990. On the 1st March, 1990, the elected Member from Dhamnagar Constituency expired. In the bye-election held for the Dhamnagar Constituency on the 29th April, 1990 Janata Dal candidate was returned to the House. The new House was constituted on the 3rd March, 1990. Shri Biju Patnaik, Leader of the Janata Dal became the Chief Minister on the 5th March, 1990. Shri Ghasiram Majhi was the Speaker protem. He administered Oath to the newly elected Members on the 6th and 7th March, 1990. Shri Yudhisthir Das was unanimously elected as the Speaker on the 9th March, 1990. On the 22nd March, 1990, Shri Prahlad Dora was elected unanimously as Deputy Speaker. The members from Bahalada and Bangiriposi Constituencies took oath on the 28th March, 1990. The first session of the 10th Assembly was held from the 19th March, 1990 to the 29th March, 1990. None of the Opposition Parties secured requisite number of seats, as a result of which in the Tenth Assembly, there was no recognised Opposition Party. Shri Arjun Charan Sethi (Bhandaripokhari) and Shri Braja Kishore Tripathy (Puri), both Janata Dal Members resigned from their membership on the 30th June, 1991 and 1st July, 1991, respectively, as they were elected in the General Election held on the 15th June, for Tenth Lok Sabha. Shri Nikunja Bihari Singh, a sitting Member of Janata Dal from Bijepur Constituency expired on the 24th August, 1991. In the bye-election held on the 16th November, 1991 for Bhandaripokhari, Puri and Bijepur Constituencies, Janata Dal candidates were elected from all the three Assembly Constituencies. Shri Radhakanta Sethi, an elected Member from C.P.I. (M) Party informed on the 19th September, 1991 to work as Independent Member in the Assembly and subsequently on the 4th March, 1992 informed to work as Member of the Odisha Communist Party. The membership of Shri Sudam Chandra Marandi elected from Bangiriposi Constituency ceased with effect from the 7th January, 1992 under Article 190 (3) of the Constitution for a period of 3 years. On the 2nd April, 1992, Shri Naka Kanaya, the elected Member from Malkangiri Constituency was expired. In the bye-election held for this Constituency on the 8th June, 1992, Shri Arabinda Dhali was returned to the House as Bharatiya Janata Party candidate. On the 17th October, 1992, Shri Trinath Nayak, the elected Member from Hindol Constituency and a Minister, was expired. In the bye-election held for this constituency on the 19th May, 1993, Smt. Patta Nayak was elected to the House as Janata Dal candidate. Shri Kumar Behera, elected Member from Bhatli (S.C.) Constituency was declared to be disqualified to hold the membership under the Tenth Schedule of the Constitution of India as he resigned from the party, w.e.f., the 1st December, 1994. Shri Biswa Bhusan Harichandan, elected Member from Chilika constituency and Shri Jagannath Mallick, elected Member from Jajpur (S.C.) Constituency resigned their seats and their resignations were accepted by the Speaker, w.e.f., the 6th November, 1994 and the 16th November, 1994, respectively. Consequent upon the expulsion from the primary membership of Janata Dal, the Speaker treated Shri Sarat Chandra Paikray, elected Member from Jatni Constituency, Shri Chandra Madhab Mishra, elected Member from Satyabadi Constituency and Shri Uma Ballav Rath, elected Member from Puri Constituency as Independent members of the House, w.e.f., the 25th January, 1995. The Assembly had all total 17 sessions with 239 sitting days and was dissolved on the 15th March, 1995. 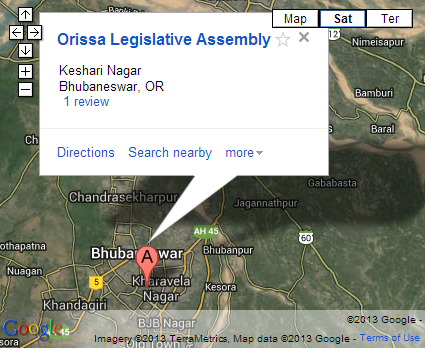 The Eleventh Odisha Legislative Assembly was constituted on the 15th March, 1995. Shri Ghasiram Majhi, M.L.A. was appointed as Protem Speaker on the 19th March, 1995 to perform the duties of the Office of the Speaker until a Speaker is elected. He administered oath to the newly elected Members of the Eleventh Odisha Legislative Assembly on the 20th, 21st and 22nd March, 1995. Shri Kishore Chandra Patel was unanimously elected as the Speaker of the Odisha Legislative Assembly on the 22nd March, 1995 and Shri Chintamani Dyan Samantra was unanimously elected as the Deputy Speaker of the Odisha Legislative Assembly on the 28th March, 1995. Shri Kishore Chandra Patel, Speaker, Odisha Legislative Assembly resigned from his office with effect from the14th January, 1996 and joined the Council of Ministers. Shri Chintamani Dyan Samantra, Deputy Speaker, Odisha Legislative Assembly assumed duties of the Speaker on the same day and resigned from the Office of Deputy Speaker with effect from the 12th February, 1996 in order to contest the Office of Speaker. Since both the posts of Speaker and Deputy Speaker were vacant, the Governor of Odisha appointed Shri Ghasiram Majhi, M.L.A. to conduct the election of the Speaker. The election was held on the 16th February, 1996 and Shri Chintamani Dyan Samantra was elected as the Speaker of the Odisha Legislative Assembly by defeating Smt. V. Sugnana Kumari Deo, M.L.A. Out of the 142 votes polled, one vote was rejected. Shri Chintamani Dyan Samantra secured 81 votes and Shri V. Sugnana Kumari Deo secured 60 votes. The Office of the Deputy Speaker was lying vacant with effect from the 12th February, 1996 after resignation of Shri Chintamani Dyan Samantra. In a meeting of the Odisha Legislative Assembly held on the 15th March, 1996, Shri Bibhuti Bhusan Singh Mardaraj was unanimously elected as the Deputy Speaker of the Odisha Legislative Assembly. Shri Janaki Ballav Patnaik, Leader of the Indian National Congress Party was sworn in as the Chief Minister on the 15th March, 1995. At that time he was not the Member of the House. On the same day, Shri Basanta Kumar Biswal, M.L.A. and Shri Hemananda Biswal, M.L.A. were sworn in as Deputy Chief Minister alongwith two Cabinet Ministers. On the 20th March, 1995, 8 Cabinet Ministers and 9 Ministers of State were included in the Council of Ministers and on the 14th January, 1996, 2 Cabinet Ministers and 5 Ministers of State were included in the Council of Ministers. On the18th August, 1997 Shri Jagannath Patnaik, M.L.A. was sworn in as Cabinet Minister. On the 24th August, 1998 Shri Mohan Nag, M.L.A. was sworn in as Minister of State. On the 9th May, 1998 Shri Hemananda Biswal, Deputy Chief Minister resigned from the Council of Ministers. On the 12th February, 1999 Shri J.B. Patnaik, Chief Minister resigned but continued till the 17th February, 1999 till alternative arrangement was made. Dr. Giridhar Gamang took charge as Chief Minister, Odisha on the 17th February, 1999. On the 22nd February, 1999, 12 Cabinet Ministers, 5 Ministers of State (Independent Charge) and 7 Ministers of State sworn in as Council of Ministers and on the 24th February, 1999 another 2 Ministers of States were included in the Council of Ministers. On the 6th December, 1999 Dr. Giridhar Gamang, Chief Minister resigned and Shri Hemananda Biswal became the Chief Minister. Shri Basanta Kumar Biswal and Shri Jagannath Patnaik were sworn in as Cabinet Minister on the same day. On the 9th December, 1999, 11 Cabinet Ministers, 8 Ministers of State (Independent Charge) and 8 Ministers of State were sworn in as Council of Ministers and again on the 11th December, 1999, Dr. Debendra Nath Mansingh, M.L.A. was included in the Council. On the 7th February, 2000 Shri Raghunath Patnaik, Minister resigned from Council of Minister. On the 26th February, 2000 Shri Hemananda Biswal, Chief Minister resigned, but continued till the 5th March, 2000. Shri Biju Patnaik, M.L.A., the Leader of the Janata Dal Legislature Party was declared as the Leader of Opposition on 23rd March, 1995 and ceased to continue as such with effect from the 20th May, 1996 on being elected to Lok Sabha. Shri Ashok Kumar Das, M.L.A. the Leader of the Janata Dal Legislature Party was declared as the Leader of Opposition on the 22nd May, 1996 and continued till the 18th December, 1997. After spilt of the Janata Dal, a new Legislature Party, namely "Biju Janata Dal" consisting of 28 Members was formed and the Hon’ble Speaker recognised the Party on the 18th December, 1997. The Leader of the Biju Janata Dal, Shri Ramakrushna Patnaik was declared as the Leader of Opposition on 22nd February, 1998 and continued up to 16th November, 1998. Shri Prafulla Samal, M.L.A. was declared as Leader of the Biju Janata Dal Legislature Party and the Hon’ble Speaker recognised him as Leader of Opposition with effect from 16th November, 1998. He continued as such up to 1st December, 1998. On the 11th December, 1998, Shri Satchidananda Dalal, M.L.A. and the Leader of Biju Janata Dal was declared as Leader of Opposition in the House. Dr. Debendra Nath Mansingh, M.L.A. and Shri Santosh Singh Saluja, M.L.A. were appointed as Government Chief Whip and Government Deputy Chief Whip respectively on the 23rd March, 1995 by Shri J.B. Patnaik, Chief Minister. Dr. Debendra Nath Mansingh, Government Chief Whip was included in the Council of Minister on the 22nd February, 1999. Shri Giridhar Gamang, Chief Minister appointed Shri Gupta Prasad Das, M.L.A. as Government Chief Whip on the 10th March, 1999. Shri Harihar Sahoo, an elected Member of the Odisha Legislative Assembly from Begunia Constituency resigned his seat on the 16th April, 1995 to make way for election of Shri J.B. Patnaik, Chief Minister. Shri Biju Patnaik, an elected Member of the Odisha Legislative Assembly from Bhubaneswar Constituency resigned his seat on the 20th May, 1996 on being elected to the Lok Sabha. Shri Kartik Mohapatra, an elected Member of the Odisha Legislative Assembly from Soro Constituency resigned his seat on the 21st May, 1996 on being elected to the Lok Sabha. Shri Rudra Madhab Ray, an elected Member of the Odisha Legislative Assembly from Dasapalla Constituency resigned his seat on the 28th February, 1997 on being elected to the Zilla Parishad. Shri Arjun Charan Sethi, Shri Prasanna Kumar Patasani and Shri Bikram Keshari Deo, elected Members of the Odisha Legislative Assembly from, Bhandaripokhari, Khurda and Junagarh Constituency respectively resigned their seats on the 6th March, 1998 on being elected to the Lok Sabha. Shri Prasanna Acharya and Shri Jual Oram elected Members of Odisha Legislative Assembly from Bargarh and Bonai Constituency respectively resigned their seat on the 11th March, 1998 on being elected to the Lok Sabha. Shri Jagannath Rout, an elected Member of the Odisha Legislative Assembly from Dhamnagar Constituency resigned his seat on the 16th March, 1999. Shri Anantaram Majhi, an elected Member of the Odisha Legislative Assembly from Laxmipur Constituency resigned his seat on the 23rd March, 1999 to make way for election of Dr. Giridhar Gamang, Chief Minister. Shri Akshaya Kumar Gomango, an elected Member of the Odisha Legislative Assembly from Gunupur Constituency expired on the 21st April, 1995. Shri Baikunthanath Swain, an elected Member of the Odisha Legislative Assembly from Kakatpur Constituency expired on the 2nd October, 1995. Shri Kailash Chandra Mohapatra, an elected member of the Odisha Legislative Assembly from Kamakhyanagar Constituency expired on the 17th September, 1996. Shri Ghasiram Majhi, an elected Member of the Odisha Legislative Assembly from Nawapara Constituency expired on the 23rd April, 1997. Shri Pradipta Ganga Dev, an elected Member of the Odisha Legislative Assembly from Deogarh Constituency expired on the 20th October, 1997. Shri Prasanna Kumar Panda, an elected Member of the Odisha Legislative Assembly from Brajarajnagar Constituency expired on the 26th December, 1997. Shri Jadav Majhi, an elected Member of the Odisha Legislative Assembly from Dabugam Constituency expired on the 3rd April, 1999. Shri Janaki Ballav Patnaik was elected to the Odisha Legislative Assembly from Begunia Constituency in a bye-election held on the 27th May, 1995 as I.N.C. candidate and took oath as a Member of Odisha Legislative Assembly on the 3rd June, 1995. Shri Bhagirathi Gomango was elected to the Odisha Legislative Assembly from Gunupur Constituency in a bye-election held on the 2nd May, 1996 as Independent candidate and took oath on the 20th May, 1996. Shri Surendra Nath Nayak was elected to the Odisha Legislative Assembly from Kakatpur Constituency in a bye-election held on the 7th May, 1996 as Janata Dal candidate and took oath on the 15th May, 1996. Smt. Indurani Mohapatra and Shri Biswabhusan Harichandan were elected to the Odisha Legislative Assembly from Soro and Bhubaneswar Constituency in a bye-election held on the 11th October, 1996 as I.N.C. and B.J.P. candidate respectively and took oath on the 24th October, 1996 and 29th October, 1996. Smt. Premalata Mohapatra was elected to the Odisha Legislative Assembly from Kamakhyanagar Constituency in a bye-election held on the 8th February 1997 as I.N.C. candidate and took oath on the 20th February, 1997. Shri Harihar Karan and Shri Jagannath Patnaik were elected to the Odisha Legislative Assembly from Dasapalla and Nawapara Constituency in a bye-election held on the 29th May, 1997 as Independent and I.N.C. candidate respectively and took oath on the 4th June, 1997 and 11th June, 1997. Shri Keshab Sahoo and Shri Subas Chandra Panigrahi were elected to the Odisha Legislative Assembly from Brajarajnagar and Deogarh Constituency in a bye-election held on the 22nd February, 1998 as I.N.C. and B.J.P. candidate respectively and took oath on the 9th March, 1998. Shri Kumarshri Chiranjibi, Shri Dilip Shrichandan, Shri Himansu Sekhar Meher, Shri Ananda Acharya and Shri Janardan Dehury were elected to the Odisha Legislative Assembly from Bhandaripokhari, Khurda, Junagarh, Bargarh and Bonai Constituency as I.N.C., I.N.C., B.J.P. and I.N.C. candidate respectively in a bye-election held on the 3rd June, 1998 and took oath on the 8th June, 1998. Dr. Giridhar Gamang was elected to the Odisha Legislative Assembly from Laxmipur Constituency in a bye-election held on the 21st June, 1999 as I.N.C. candidate and took oath as Member of the Odisha Legislative Assembly on the 28th June, 1999. Hon’ble Supreme Court of India vide its judgement dt.14.09.1999 in Civil Appeal No.335 of 1999 in case of Shri Somanath Rath Vrs. Shri Bikram Keshari Arukha and others had set aside the election of Shri Bikram Keshari Arukha, the candidate returned from Bhanjanagar Assembly Constituency under Section 100 (1) (c) of the Representation of Peoples’ Act, 1951. Consequent upon the said judgement the Bhanjanagar Assembly Constituency seat was rendered vacant with effect from the date of aforesaid judgement i.e. dt.14th September, 1999. The first session of the Assembly was summoned to meet on the 23rd March, 1995 and had all total 17 sessions and one special session for 50th Anniversary of independence with 248 sitting days. The Eleventh Assembly was dissolved on the 29th March, 2000. The Twelfth Odisha Legislative Assembly was constituted on the 29th February, 2000. Shri Habibulla Khan, M.L.A. was appointed as Protem Speaker on the 6th March, 2000 to perform the duties of the office of Speaker until a Speaker is elected. He administered Oath to the elected Members of the Twelfth Odisha Legislative Assembly on the 7th and 8th March, 2000. Shri Sarat Kumar Kar and Shri Rama Chandra Panda was unanimously elected as the Speaker and Deputy Speaker of the Odisha Legislative Assembly on the 10th March, 2000 and 27th March, 2000 respectively. Shri Naveen Patnaik, the Leader of the Biju Janata Dal Legislature Party was sworn in as Chief Minister alongwith 14 Cabinet Ministers, 6 Ministers of States (Independent) and 4 Minister of State on the 5th March, 2000. On the 9th July 2001 Dr. (Mrs) Kamala Das and Shri Nalini Kanta Mohanty (both Cabinet Ministers) and Shri Prasanta Nanda, Minister of State (Independent) ceased to be member of the Council of Minister. On the 6th August, 2002 Shri Adwait Prasad Singh (Cabinet Minister), Shri Duryodhan Majhi, Minister of State (Independent) and Shri Debi Prasad Minishra and Shri Amar Prasad Satpathy, Minister of State resigned from the Council of Ministers. On the same day four Cabinet Ministers, two Ministers of State (Independent Charge) and two Ministers of State were included in the Council of Ministers. On the 7th August, 2002 Shri Ramakrushna Patnaik, Minister resigned from the Council of Ministers. Shri Ramakanta Mishra, M.L.A., the leader of the Indian National Congress Legislature Party was recognised as the Leader of Opposition with effect from the 21st March, 2000. Shri Naveen Patnaik, Chief Minister appointed Shri Pradeep Maharathy, M.L.A. and Shri Jayanarayan Mishra, M.L.A. as Government Chief Whip and Deputy Chief Whip respectively on the 22nd March 2000. Shri Biren Palei, an elected Member of the Odisha Legislative Assembly from Bhadrak constituency expired on the 2nd March, 2001. Shri Duryodhan Sohela an elected member from Rairakhol constituency expired on the 4th August 2001. Shri Bhagabat Behera an elected member from Nayagarh constituency expired on the 3rd June 2002. Shri Baishanaba Pradhan an elected member of the Odisha Legislative Assembly from 114- Biramahajanpur Constitutiency expired on the 21st May, 2003. Shri Sanatan Bisi was elected to the Odisha Legislative Assembly from Rairakhol constituency in a bye-election held on the 20th September, 2001 as Biju Janata Dal Candidate and took oath as Member of the Odisha Legislative Assembly on the 25th September 2001. Shri Prafulla Samal was elected to the Odisha Legislative Assembly from Bhadrak constituency in a bye-election held on the 31st May 2002 as Biju Janata Dal candidate and took oath as Member of the Odisha Legislative Assembly on the 5th June 2002. Smt. Mandakini Behera was elected to the Odisha Legislative Assembly from Nayagarh constituency in a bye-election held on the 2nd July 2002 as Biju Janata Dal Candidate and took oath as member of Odisha Legislative Assembly on the 11th July 2002. Shri Sanjib Kumar Sahoo was elected to the Odisha Legislative Assembly from Birmaharajpur Constituency in a bye-election held on the 27th Septmber 2003 as Biju Janata Dal Candidate and took Oath as Member of Odisha Legislative Assembly on the 1st October 2003. Shri Trilochan Behera, MLA, the lone Member from All India Trinamool Congress Party joined as a member of Biju Janata Dal Legislature Party w.e.f. the 25th April, 2001. Shri George Tirkey, MLA who constituted one third of the total member of JMM Legislature Party in Odisha Legislative Assembly was allowed to form a separate group in the Odisha Legislative Assembly w.e.f. 20th August, 2001 and then merged with the Biju Janata Dal Legislature Party w.e.f. the 21st August, 2001. Shri Sudam Marandi was recognised as a Member of JMM (A) Group and Shri Kishor Das was recognised as the Member of JMM (B) group w.e.f. the 29th Augest 2003. Shri Nalini Kanta Mohanty, MLA was expelled from B.J.D. on the 19th July, 2001. This was announced by the Hon'ble Speaker in the Odisha Legislative Assembly on the 30th July 2001. The First Session of the Odisha Legislative Assembly was summoned to meet on the 22nd March, 2000 and had altogether 13 (Thirteen) Sessions with 214 sitting days till the end of July 2003. The Twelfth Assembly was dissolved on the 6th February 2004. The Thirteenth Odisha Legislative Assembly was Constituted on the 15th May 2004. Shri Habibulla Khan, M.L.A. was appointed as Protem Speaker on the 18th May 2004 to perform the duties of the Office of the Speaker until a Speaker's elected. He administered Oath to the elected Members of the Thirteenth Odisha Legislative on the 19th and 20th May 2004. Shri Maheswar Mohanty and Shri Prahlad Dora were elected as the Speaker and Deputy Speaker of the Odisha Legislative Assembly on the 21st May 2004 and 3rd July 2004 respectively. Shri Mohanty resigned on 31st March, 2008. Shri Kishore Kumar Mohanty was elected Speaker on the 19th August, 2008. Shri Naveen Patnaik, the Leader of the Biju Janata Dal Legislature Party was sworn in as Chief Minister alongwith 14 Cabinet Ministers and 1 Ministers of State on the 16th May 2004. On the 26th July 2004 Smt. Pramila Mallik, Cabinet Minister of Women and Child Development tendered her resignation and her portfolios were allotted to the Chief Minister. She was reinducted to the Cabinet with the same portfolios on the 22nd September 2004. On the 23rd March 2006 Shri Rabi Narayan Nanda, Minister of State, Science & Technology (Independent Charge) and Water Resources tendered his resignation and his portfolios were allotted to the Chief Minister. On the 25th April 2006 Shri Kalindi Behera, Minister, Scheduled Tribes & Scheduled Castes Development (Scheduled Castes Development), Minorities & Backward Classes Welfare and Excise tendered his resignation and the portfolios were temporarily allotted to Shri Padmanabha Behera, Minister of Steel & Mines and Parliamentary Affairs. Shri Janaki Ballav Patnaik, M.L.A., the Leader of the Indian National Congress Legislature Party was recognised as the Leader of the Opposition on the 4th June, 2004 has ceased from 24.01.2009 and Shri Ulaka Ramachandra has been recognized as the Leader of the Opposition from 24.01.2009. Shri Naveen Patnaik, Chief Minister appointed Shri Kishore Kumar Mohanty, M.L.A. as Government Chief Whip on the 20th May 2004 and Shri Shankarsan Naik, M.L.A. as Government Deputy Chief Whip on the 30th June 2004. On the death of Shri Naik, Shri Mohan Charan Majhi was appointed as Government Deputy Chief Whip on the 28th February 2005. Shri Kishore Kumar Mohanty, Government Chief Whip resigned on 17th August, 2008. Shri Bikram Keshari Arukh was appointed as Government Chief Whip on the 18th August, 2008. Shri Shankarsan Naik, M.L.A. and the Government Deputy Chief Whip expired on the 11th January 2005 in a road accident. Shri Gajadhar Majhi, on elected Member of Odisha Legislative Assembly from 136-Talsara (ST) constituency expired on 20th may, 2006. Shri Anantaram Majhi, MLA an elected member of Odisha Legislative Assembly from 083 Laxmipur (ST) Constituency expired on 25.11.2007. Smt. Sushama Patel was elected to the Odisha Legislative Assembly from 135-Sundargarh Constituency in a bye-election held on the 21st April 2005 as B.J.P. candidate and took oath as Member of Odisha Legislative Assembly on the 4th May 2005. Shri Prafulla Majhi was elected to Odisha Legislative Assembly from 136 (ST) Constituency in a Bye-election held on 30.10.2006 an took oath as a Member of OLA on 2.11.2006 as Congress Candidate. Shri Purna Chandra Majhi was elected to Odisha Legislative Assembly from 083(ST) Constituency in a Bye-election held on 12.04.2008 an took oath as a Member of OLA on 18.04.2008 as Congress Candidate. The first session of the Odisha Legislative Assembly was summoned to meet on the 30th June 2004 and had 17 sessions with 265 sitting days. The 13th Assembly was dissolved on 19th May, 2009. 2. His Excellency Mr. George Townsend Boag, -- 11.08.1938 - 07.12.1938 C.S.I.C.S.E., I.C.S. (Acting). 4. His Excellency Sir Howthorne Lewis, -- 01.04.1941 - 31.03.1946 K.C.S.K.C.I.E., I.C.S. 5. His Excellency Chandulal Trivedi, -- 01.04.1946 - 14.08.1947 K.C.S., C.I.E., O.B.E., I.C.S. 16. Fourteenth Assembly -- 19.05.2009 -Continuing. 2. 11.01.1971 03.04.1971 (Assembly was suspended and subsequently dissolved on 23.01.1971). 4. 16.12.1976 29.12.1976 (Assembly was suspended).